In this book with a vague title[] Christine Tappolet aspires to provide us with "a highly attractive account of emotions" (xi). This is a brave attempt given the less than 200 pages of the text. As a result the argument is dense, yet still some issues are left aside. The book is a reworking of Tappolet's earlier contributions: of the five chapters only one is entirely new. I am not convinced if the project is completely successful: the five chapters are of varying quality and do not always match one another. Each chapter is closed with a tiny (no more than 1 page long) conclusion and, regrettably, there is no general conclusion to bring together what emerges from the entire discussion. The account of emotions Tappolet offers presents them, broadly speaking, as perceptual experiences of the world comprehended as the world of values. In first chapter (Emotions and Perception, pp. 1-45) Tappolet discusses a number of current theories of emotions before presenting the perceptual theory of emotions; thereafter she focuses on criticisms that can be directed at the latter. Unlike many philosophers Tappolet takes emotions to be episodes not only short-lived but also lasting days, months and years, with a representational but non-conceptual content. If Tappolet opts for the perceptual theory of emotions this is because emotions are analogous to perceptions in that both are conscious states, are automatic (i.e. not subject to the will), world-guided, are either correct or incorrect, manifest inferential isolation, and have similar content (i.e. a content that changes depending on variations of the object). Tappolet lists also the differences between emotions and perceptions: unlike the latter emotions have no specific organs, have a different phenomenology, are valenced, and lack transparency. Some of emotions are dependent on cognitive states and are characterized as rational. In this context it would seem important to give conditions on which emotions are correct rather than incorrect, rational rather than irrational, and depend on cognitive bases rather than do not depend on them. This is important insofar as we deal here with phenomena characterized but contrasting features, yet belonging to the same class of emotions. Chapter two is about Emotion and Motivation (pp. 47-78). After examining the so-called motivational component of emotions (Tappolet's example being fear), which amounts to the fact that "emotions generally influence how actions are performed" (59-60), Tappolet accurately points to a group of contemplative emotions, i.e. emotions not triggering any motivation (you may well experience a "purely contemplative fear, which has no motivational force whatsoever", (64))[]. Tappolet discusses then several technical issues. Yet, I cannot find any answer as to the conditions under which fear is motivational or contemplative. This omission is all the more glaring, since if "it is clear that desires are not essential ingredients, or part, of the emotion of fear as such [...]" and "the desire [is] involved [...] only contingently" (66), it is fundamental to know why to consider this characteristic in analysis of emotions at all, as does Tappolet recognizing that both motivating and contemplative are possible options in "many, if not all, kinds of emotion" (74). But if the link is optional, "relation between emotions and motivation is looser than what has been usually been taken to be the case" (76). In chapter three (Emotion and Values, pp. 79-120) several Neo-sentimentalist accounts of emotions are analysed and discussed. Two main Neo-sentimentalist accounts are normative and representational. Sentimentalism is the view that values are grasped by the affective. Although the concept of value is often connected lexically with an emotion term (e.g. admirable/admire, shameful/shame), this does not have to be so and there are also values-concept without such lexical connection (e.g. worthy of anger/anger). On such a view a value-concept is a formal object of the corresponding emotion, provided that it is appropriate. And this is where the issue opens widely. In fact, it is crucial to know how and when an emotion is appropriate, on which conditions "what [one] admire[s] is genuinely admirable" (82), what it is for an emotion to be accurate or correct. Tappolet tells us that appropriateness may be conceived in several ways but, as it seems to me, in what follows she doesn't succeed in explaining the notion of an emotion's appropriateness. This is where the crux of the matter lies. For to say that "an appropriate emotion is one that ought to be felt" (Normative Neo-Sentimentalism) or that "appropriate emotions are emotions that are correct from epistemic point of view" (Representational Neo-Sentimentalism) (86-87) is to explain appropriateness by either duty or correctness. And with that Tappolet takes appropriateness for granted. But one might still ask what "ought to be felt" and what a "correct emotion" pertains to. Going back to perceptual analogy, I suppose it shouldn't be claimed that a stick immersed in water is or should be seen as straight. In other terms, how to tell that what is felt is what should be felt or is felt correctly? Next, while the step "[w]hen something amuses me, I am inclined to think that the thing in question is amusing" (100) looks more or less unproblematic, the reverse step is not so much so, because it may happen so that an amusing thing doesn't amuse me and this for several reasons[]. But even this first step might make some people smile as they would ask for a qualification of "amusing for me", or even "amusing for me, in this very moment, in this very regard, in these very conditions etc.". Tappolet takes into consideration factors endangering the appropriateness of an emotion (she calls them "defeaters") but only few, while they are much more[]. A surprising move comes about when Tappolet overturns the meaning of appropriateness: "it does not follow that such reactions are inappropriate in all the senses of the word" (109). But if so, these senses should be specified, as it seems to me, or otherwise a confusion quickly rises. They should not point to "biological normalcy, moral appropriateness, admirableness qua parent, caregiver or friend, or usefulness" (110) but rather to appropriateness as universal versus local or specific category. If the latter, appropriateness as criterion is of no avail in constructing a wholesale account of emotions. To be certain, Tappolet is aware of "the huge variety of items that can be admirable" and that "at best, what is admirable is equivalent to a large disjunction of natural properties" (119) but she seems not to be worried by this and makes the enigmatic claim that "[s]ince properties such as being admirable are eminently useful to explain our choices and actions, a good argument for the inclusion of such properties in our ontology can be made" (119). Chapter four (Emotion and Responsibility, pp. 123-159) is the only chapter with entirely new material. Tappolet discusses there Strawsonian theories of responsibility which makes the chapter the most technical and concerned with specific difficulties. In all frankness I don't know what is its role in the account of emotions. Obviously, the relationship between emotion and responsibility is not an insignificant issue but I wonder if it is as important as to dedicate to it a whole chapter while other, more burning questions are left unanswered. More to the point, the issue of emotion and responsibility is what conclusions of the previous chapter/s do not require nor what is expected to be treated subsequently at the end of the previous chapter. Be as it is, Tappolet goes for the claim that emotions are related with responsibility indirectly, that is via evaluative properties (but this is what Tappolet elaborates not earlier than in the last section of the chapter)[]. Tappolet draws again on the concept of appropriateness of emotions, still unexplained and in fact muddled even further in one passage ("the idea is to distinguish between different concept of appropriateness, so as to make room for different kinds of assessment of the reactive attitudes" (147)). In spite of this appropriateness serves her to formulate the Mediation Thesis which links emotion and responsibility. But then we learn that "emotions [are] often [sic!] involved in evaluative judgments" (155). The chapter ends with an important remark that absence of name in natural language for an affective state or action doesn't mean that such state or action is nonexistent. The last chapter (Emotion and Agency, pp. 161-195) is the most inspiring of all book since it opens vista on the role emotions play in human life. It also deploys a defense against the bad press they often have. Tappolet paints a bright and warm side of affectivity: its involvement in autonomy and authenticity. Alas, once again it is not explained why often but not always emotions are responsible for akratic action and when they are, why often but not always emotions are not to be blamed and when should they be, and, finally, why often but not always emotions "inform us about practical reasons" (167)[] and when do they actually do. In other words, what is the constitutively different between the two opposed subclasses of the same class of the emotion? Appropriateness of emotions is again (see Ch. 3) at stake, this time conceptualized also as justification or reliability. 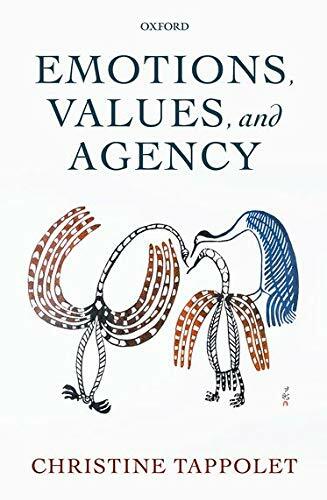 We are told that in the absence of reason to distrust the cognitive bases of the emotion, emotion in question is trustworthy (see 169), and that the appropriateness of emotions may be ascertained by testing its intrapersonal and interpersonal discrepancies (see 195, i.e. the last page of the book, but also Ch. 3, 100 and 102: "mak[ing] sense of intrapersonal and interpersonal discrepancies"; in Ch. 3 Tappolet suggests also to weaken our doubts about the correctness of emotions through experience (vide Hume, (97)), or by "shared practise of discounting certain conditions" (98)). This is optimistic and promising, however I wonder if relying on the lack of defeater is not epistemically similar to inferring from silence. Tappolet acknowledges that "in most cases what counts as a defeater cannot be known a priori" (170), and that "in order to determine what counts as a defeater, we need to take into account not only our own experiences at different times, but also the experiences of other persons" (172). Though I sympathize with this option I must recognize that at this point we are still far from getting an infallible mark of epistemic correctness of emotions. And this is the end. Since there is no general conclusion to the five chapters one may ask what is Tappolet's final word. My main uneasiness with this book is that Tappolet uses repeatedly labels positive and negative for emotions (e.g. emotions "can be either positive or negative" (133), "two large groups, the positive and the negative" (140)), which is natural and common in everyday talk but misleading in philosophical investigation unless both categories or their referents are clearly defined, which is not, unfortunately, the case here. The most puzzling, however, is the point mentioned already above, that is the lack of explicit treatment of the distinction of opposed subclasses within the class of emotions. Which of them and why some are authentic and autonomous and which and why others are not? Words like can and sometimes too often load Tappolet's discourse with imprecision or vagueness. It may be disappointing because the reader, both expert and novice, is, after all, looking for the heart of the matter. If the distinction between various categorial groups of emotions is not given, what it does mean that emotions are positive or negative? And when Tappolet minimizes the distinction by suggesting that it is contingent, it makes things hardly better. For instance, we are told that "even emotions such as fear and anger can be contemplative, in the sense that no desires at all need to be involved" (78) - and one's most urgent query may be to know when they are and when they are not contemplative. On another occasion we read that "[e]ven though evaluative judgments do not necessarily involve a motivation to act accordingly, most will, because most evaluative judgments are grounded in emotions and emotions usually involve motivations" (143, n. 33). And that leaving aside the contingent involvement of desire (see 66, quoted above). I also think that Tappolet too quickly dismisses cognitive approach. While her examples are adequate, there is at least one which goes in favour of cognitive approach to emotions: often, it is true, you fear a spider despite your thinking it is innocuous but this is not so in the case of fearing a tarantula (see 165). Since there is fear based on cognition and fear in conflict with it, the main issue would be, again, to find a common denominator for both. Unless those who claim that there is no such a natural category as emotion are in the end right. The language is technical on many pages which makes reading a bit difficult for non-experts. This is a pity because this is a valuable book and worth reading by anyone interested in emotions generally and, more particularly, in how the current philosophical debate on affectivity is going on. This is an inspiring contribution insofar as it provokes more questions than gives answers and demonstrates how much affectivity remains an unexplored territory. [] A short look at the contents shows that Emotion, Perception, Motivation, Values, Responsibility, and Values would correspond better to what the book is about. [] To say that - my example - the effect of, e.g. sadness is to make a person sad would be to confuse the essence with the result. Tappolet's examples of par excellence contemplative emotions are: "admiration, joy, relief, and awe" (75). [] Consider something surprising, which, however is no longer so for me, as I am familiar with it. Though it doesn't trigger surprise in me, I do recognize its surprising character, if seen for the first time. [] For more see e.g. an analysis of obscuring factors in: J. D’Arms & D. Jacobson, "Demystifying Sensibilities: Sentimental Values and the Instability of Affect" (in: The Oxford Handbook of Philosophy of Emotion, (ed.) P. Goldie, Oxford: Oxford University Press 2010, 585-613). [] And when it comes to appropriate envy (see 146), one may think about Aristotle's view on which only the middle is appropriate but never the extremes. [] There are other distinctions too, e.g. "the basis of emotions can involve genuine agency" (176), or "an emotion can amount to acting in light of one's reasons" (186), yet again, with no investigation into conditions on which it can and cannot.